It was a miserable end to half-term skiing holidays for many as a whiteout hits the major roads in the French Alps on Black Saturday, but the delays didn’t stop there. Also, snowmobile and pedestrian segregation in Finland. German police impose a mega on-the-spot speeding fine due to lack of ‘info sharing’. Belgium sees 2015’s first proper Monday morning traffic jams. Farmer road protests set to ‘shake Poland’ this week. Sadly, no Estonia ice roads this year. Drivers and passengers left asking why operators not better prepared. ‘Picture of the day,’ said @TRAFvacances. Rescue efforts hampered by drivers stopping by the side of the road to fit snow chains. But what choice did they have? Despite advance warnings for one of the busiest days of the winter holiday season, ‘Snowmaggedon’ hit the major roads in the French Alps on Saturday stranding five hundred people overnight. 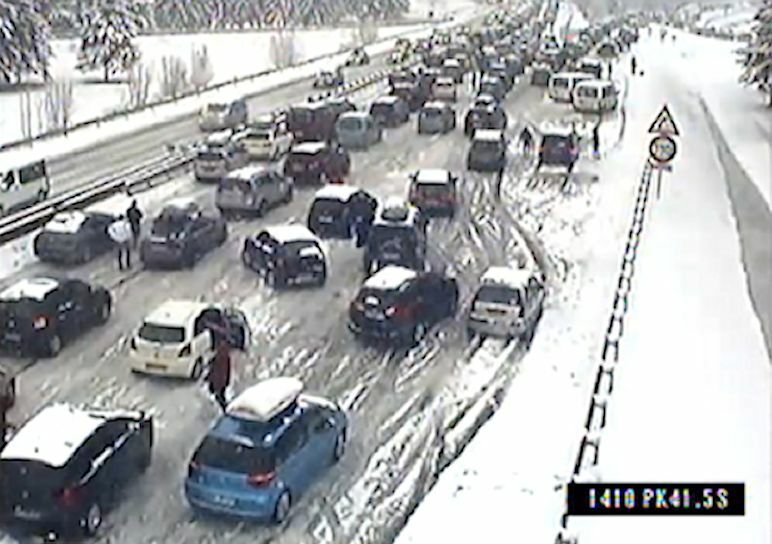 The storm first hit the A40 between Macon and Geneva at around nine o’clock before heading south to the A43 Lyon-Chambery and A48 Lyon-Grenoble by lunchtime. The A40 was free by late afternoon but the A43 and A48 remained closed overnight. Exactly as the similar sudden snow on the N90 Bourg-Moutiers-Albertville last month, rescue efforts were reportedly hampered by drivers stopping by the side of the road to fit snow chains. British drivers then faced hours’ long delays at Eurotunnel later as a sudden glut of passengers descended during the night. Sunday night saw further queues. Passengers arriving at 22:00 faced a four hour delay as an IT glitch and cancelled trains compounded queues which only finally cleared at 05:00. @Veronica_Foote_ asked Eurotunnel, ‘One of your busiest days and the delays are building up due to two cancelled trains… Where’s the investment? Chaos,’ but never received a response. Random from @VisitRovaniemi, Finland. 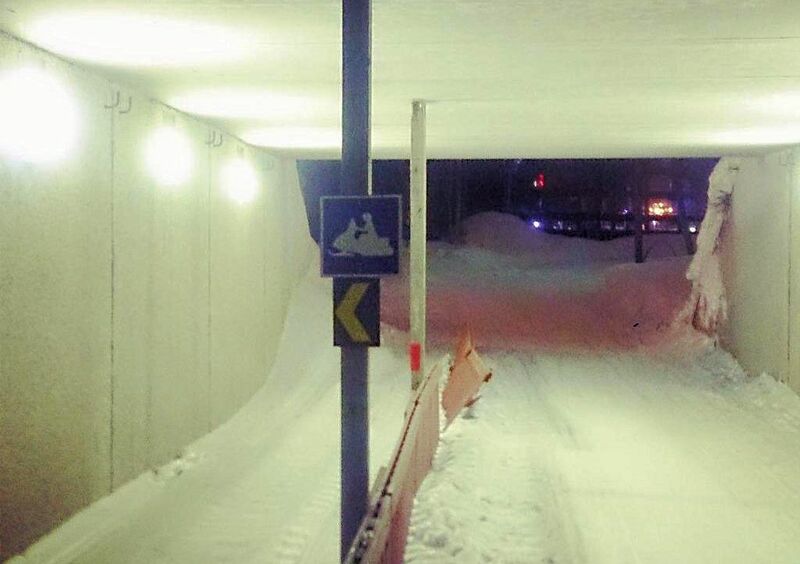 ‘Pedestrian underpasses have snowmobile lanes’. roundup: GERMANY. A Danish woman, resident in Switzerland, was forced to pay a €1,230 deposit on-the-spot after being caught speeding at 162kmh in a 80kmh zone on the A7 autobahn, presumably between the Danish border and Hamburg, reports the Copenhagen Post. Police demanded the cash because, the paper says, there is no driver ‘info sharing’ arrangement with Switzerland. It may have its wires crossed; the current cross-border prosecution rules do include all EU countries – except, until May 2017, the UK, Ireland and Denmark – plus Norway and Switzerland. BELGIUM. The return to work after half term saw 2015’s first proper Monday morning rush hour. Traffic so far this year has been relatively muted on the first day of the working week – traditionally when Belgian roads are at their busiest – but today, with heavy rain in the west and snow and ice in the east, and accidents on the E40 eastbound into Brussels and R1 ring road in Antwerp, there was a combined total of 450km of jams first thing, easily beating last year’s maximum of 380km reports Deredactie.be. POLAND. Farmers are set to re-run protests this week, possibly tomorrow. The past two Wednesdays have seen major road blocks around the country, especially in Warsaw. One man tells TheNews.pl the protests will ’shake Poland’. ESTONIA. A mild winter means the ice roads will not open this year reports the Baltic Times. Traditionally there is a 3.5km ice route opened between Haapsalu, the Noarootsi Peninsula and Vormsi island, and between the West Estonian islands Hiiumaa and Saaremaa.